Several times over the years, I’ve been asked for a recipe for Liuzhou’s most famous dish – luosifen (螺蛳粉). It seems people want to try making this at home, far from Liuzhou. a) No one cooks luosifen at home. No one. Not anyone. It is strictly an eating-out dish. Preferably in iffy-looking shacks. 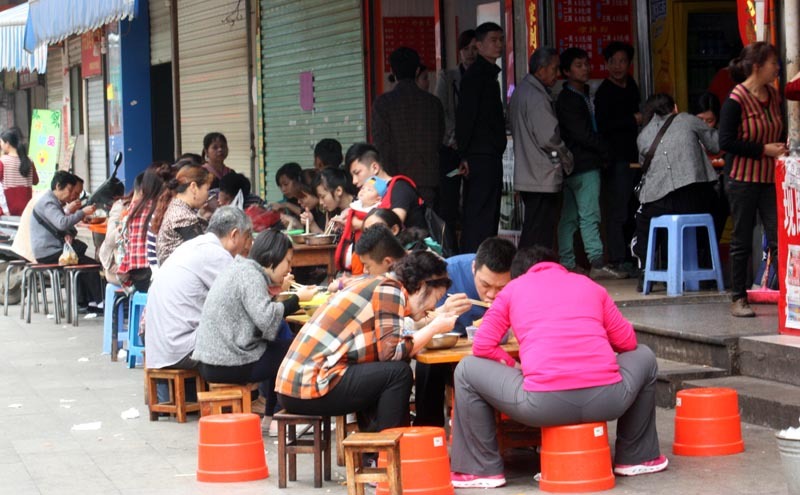 Liuzhou Hotel does do it (at three times the street price), and theirs is very good, but the best is still in the smaller restaurants, eaten while perched on a tiny stool on the sidewalk. So. No one has ever, to my knowledge, thought to print a recipe for the home cook. No home cook wants one. The logistics involved would mean that a home-made bowl of the spicy delight would cost several times what you can get it for at the end of the street. b) Each luosifen shop or restaurant has its own recipe for the soup base – and each keeps that a closely guarded secret. Minor wars have erupted in the past when Restaurant A thought Restaurant B was trying to steal their secret recipe. So. No restaurant has ever published a recipe. However, after intensive investigations, aided by NSA, GCHQ and Edward Snowden, using torture and blackmail etc, some details can be revealed. The stock/broth/soup base is based on the local river snails (螺蛳). These are boiled, along with pork bones, for anywhere between 3 and 10 hours. Additional ingredients include black cardamom, fennel seed, dried tangerine peel, cassia bark, cloves, salt, pepper, bay leaf, licorice root, sand ginger, and star anise. Typically, no quantities are given. No one really weighs or measures anything. Each shop ‘knows’ how much of anything is needed. There may be other ingredients, too. Luosifen has a Facebook page.
. This entry was posted on Sunday, April 13th, 2014 at 4:19 pm	and is filed under Food and Drink, Luosifen. You can follow any responses to this entry through the RSS 2.0 feed. Both comments and pings are currently closed. Too many ingredients cannot be had here at any cost! But I will substitute what I can and try to make something similar. In my experience most good cooks rely on instinct more than measuring cups and spoons.